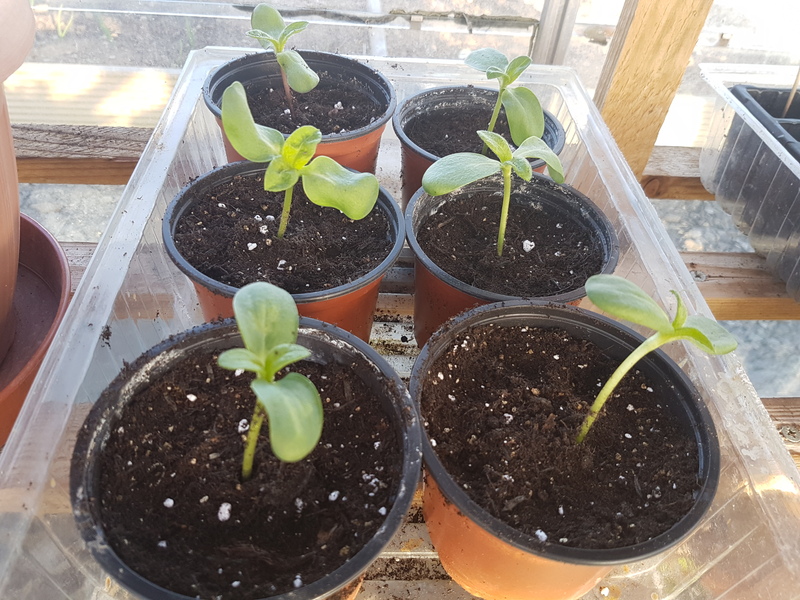 A lot more of my seeds are failing this year than I’d like to admit however the sunflowers are doing terrifically well so far. I put down seeds both inside and outside and both are coming up. The outside seeds are planted in a bed and are just now starting to peek above the soil. The seeds in the greenhouse have been shooting up fast and today had stems on average about one to two inches long. Time to move them on. I’m using three inch pots to transfer the seedlings from seed trays. 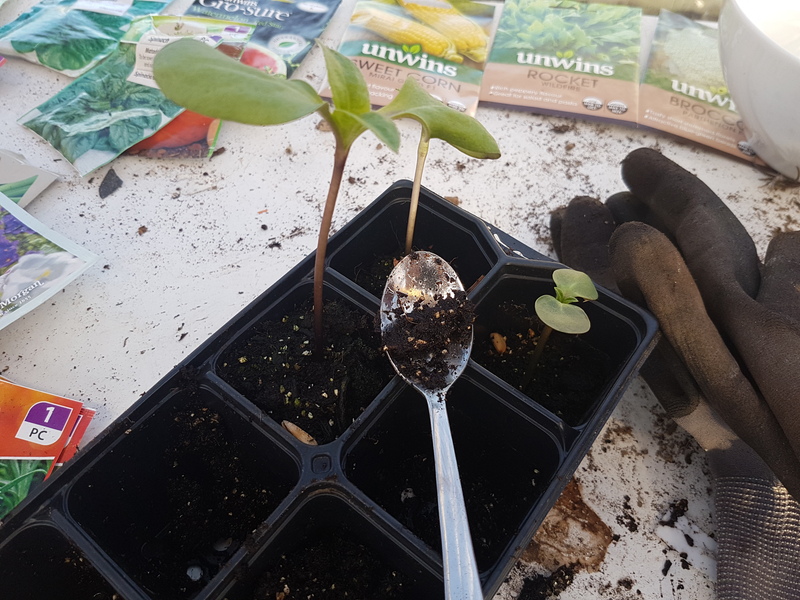 There’s many ways of pricking out seedlings from trays but I find using a teaspoon is a great way to scoop them out with the roots and surrounding soil intact. Moving them into their new pots I pack down the new compost a little but not too hard. This is so when I lightly water the pots later the soil won’t be so loose it starts swimming around the pot. Once the seedlings get settled I’ll water from the bottom but for now I want to make sure the water gets down to the disrupted root system. So for the minute I have 36 sunflowers potted on. It’ll be interesting to see if they all survive the process and continue to develop. I hope they do as we had a great but small batch of sunflowers last year and I’d love a big batch this year to give the mass green of the garden a complimentary lift of yellow. For the last two years I’ve been growing some laurel hedging around the outside of my patio. The main function of the laurel is for cover on the patio from the cold and strong winds that blow through. The area ia fairly exposed to the winds so strong tall laurels should help break it up a bit. 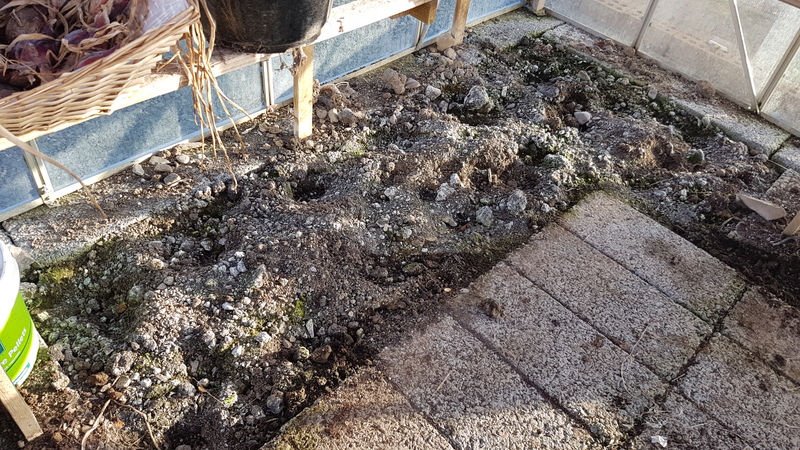 Anyway, the area around the base of the plants has been infested with weeds and I’ve never gotten round to sorting out the mess. Until now. This year’s I’m covering the whole base with bark clippings for two reasons. 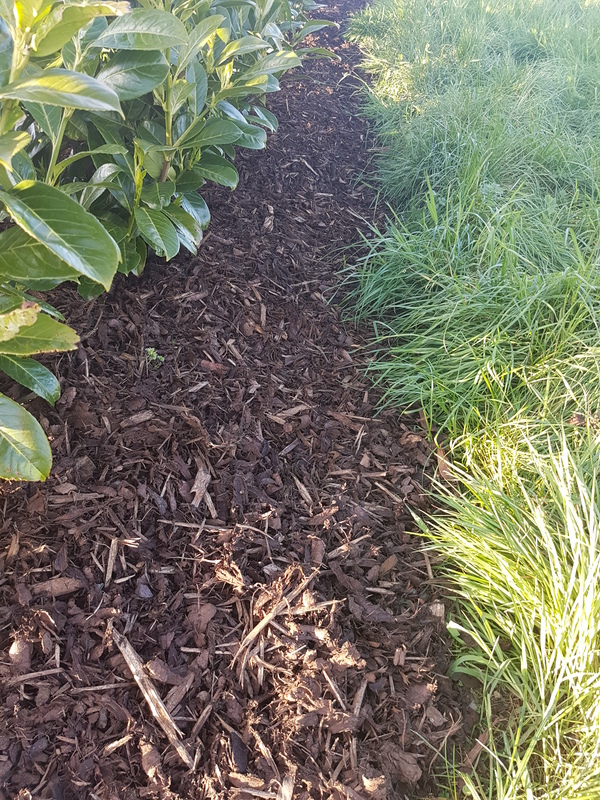 Mulching can kill off and keep down the weeds and to create a nicer aesthetic around the patio area. I’m putting down large bags of bark and spreading it quite thickly. A thin layer of mulch may as well not be there. The weeds will just come back. 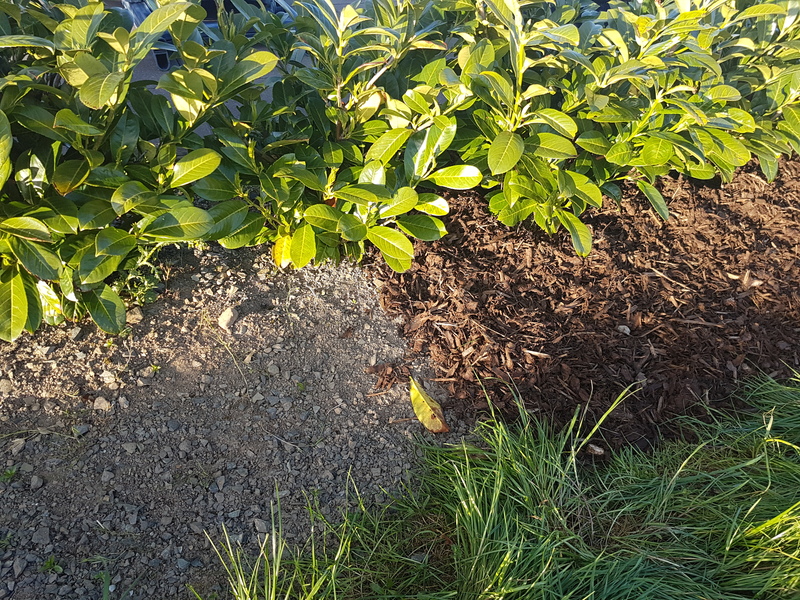 A thick mulch blocks out all the light and suffocated the weeds. I also make sure the bark isn’t gathered too close to the laurels base. Piling up bark around the base might end up trapping too much moisture and causing disease or mould to take a grip and destroy the plant and hence a few years of growth. At €7 a bag and a thick spread it’ll take a few weeks to get the whole area mulchedbut I think it’ll be worth it and give the patio a clean vibrant look. 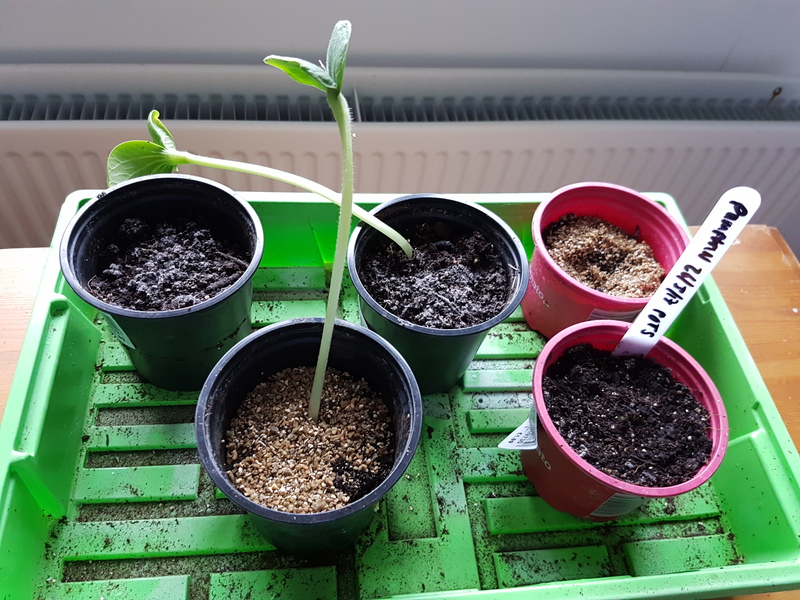 Was a having a bbusytime this week and it clear slipped my mind to check on my seeds that I have squirrels away ina warm room upstairs in the house. 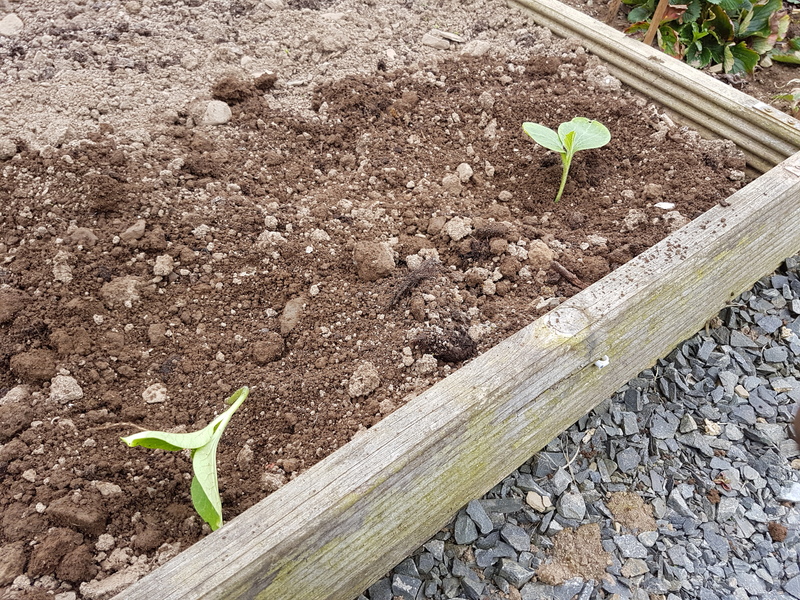 When I finally got back to them I was pretty shocked to find two pumpkins seeds had shot up to a ridiculous length one r the previous 2 or 3 days. These two were so leggy they could have given Mo Farrah a run for his money. And yet the other three seeds hadn’t budged as far as I could see. 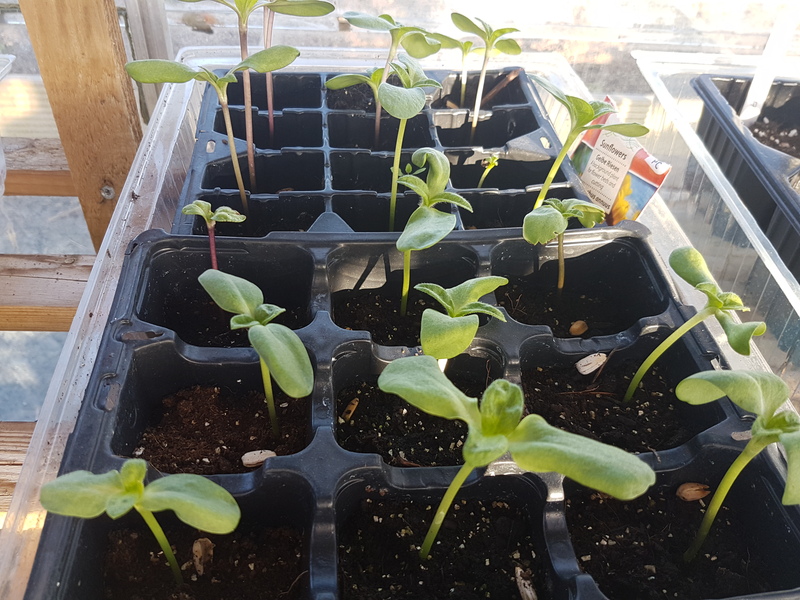 Now i know these are probably way too leggy to properly develop into good plants but i really hate to throw out seedling without giving it a chance. 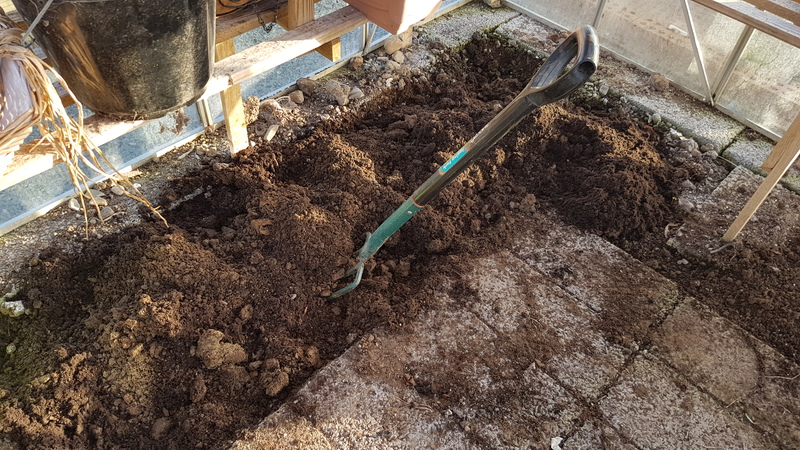 For the time being I have a spare raised bed so I pulled out the leggy seedlings and buried them deep enough so that only a small amount of the leggy stem was showing above the surface of the soil. I doused them with a good strong tomato feed and water mix to give them a good start. No time for hardening off or clothes with these two. They’ll either sink or swim and if they sink they’ll be replaced with the next batch of seeds which I’ll probably now have to put down. After what seems like an interminable age my chilli peppers have finally sprouted. You might remember from an earlier post how I tried a little experiment with these. I topped half the seeds withmy standard compost mix and topped the other half with just a little vrrmaculite. I wanted to see if either of the toppings would make any difference to how quickly or succesfully the seeds would sprout. As you can see from the following photo there was virtually no difference whatsoever. With the compost topping 3 of 6 seedlings came up. With the vermiculite topping 3 of 5 came up. So very little difference and a test set too small to draw any specific conclusions. Another set of chilli seeds this time Tokyo Hot showed the Sammie results 2 seedlings for each topping type and one failure for each. 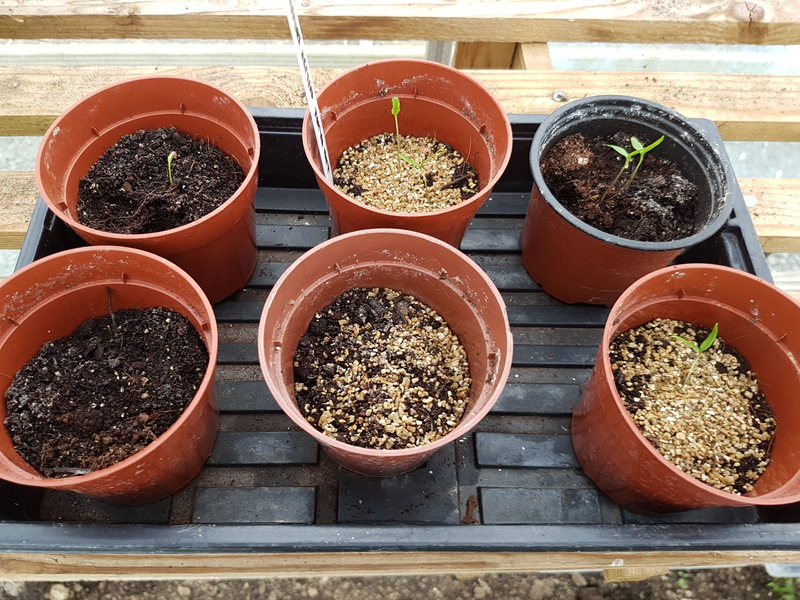 From this little experiment I’ve concluded that the topping type doesn’t really matter and I’d be better saving the vermiculite for mixing with potting compost to make my standard potting mix. The last two years have been a disaster for my peppers. 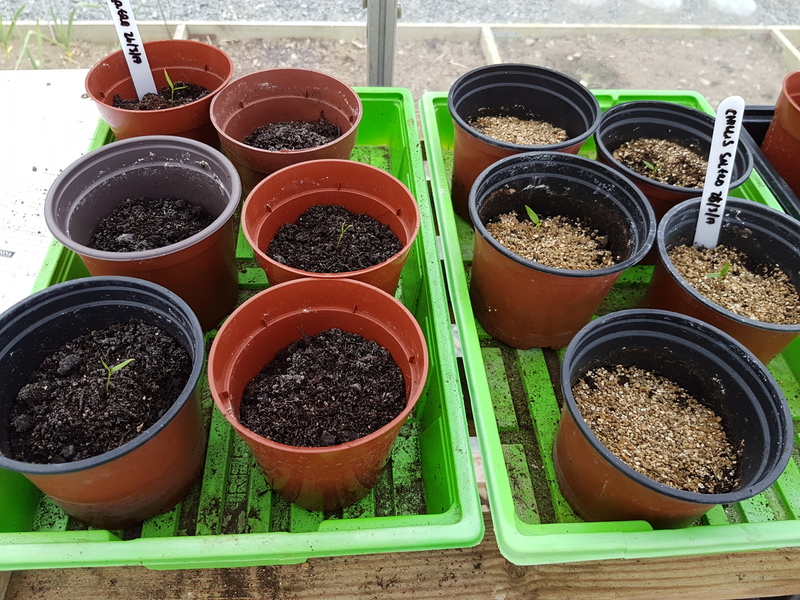 Longer winter’s with a summer filled with cold wet weather meant slow developing pepper plants yielding small amounts of fruit late into the autumn. A really frustrating two years considering my first year gardening produced numerous plants delivering loads of large peppers with relative ease. This year I WANT my peppers back. I’ve gotten good seeds and plenty of them. I’m putting them down en masse and have resolved to keep a very close eye on their development. 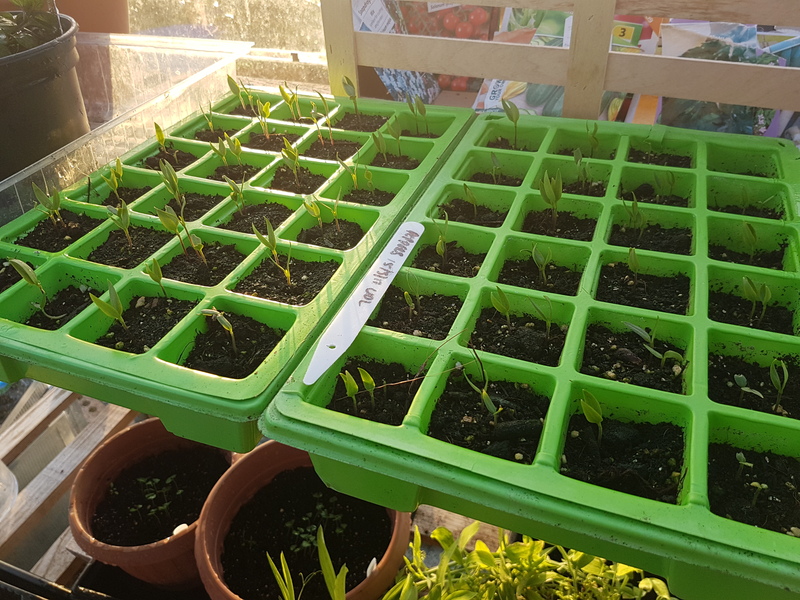 Starting the seed trays indoors in a warm sun facing room for almost two weeks has given them a good start and the seedlings started to push their way out the soil. I immediately moved them out to the greenhouse as I’ve already had some problems with leggy seedlings this season. This seems to have the effect and slowing their growth a little as they move to a slightly colder environment but that’s ok. They can take their time now and gain strength and develop properly. As I put them down two seeds to a plug some may need thinning out once they really get going. Only time will tell now if there’ll be enough seedlings developing for the thinning. I have a compost bin. It is a terrible terrible place. It is filled with everything a compost bin should not be filled with, in particular clumps of soil and weeds. So many weeds. Of course this is not of my doing. My dad is a fiend for trying to compost the uncompostabils. If that’s a word. Today I decided to dump the lot and start again. Opening up the bin a d forking the lot into a wheelbarrow for dumping was a brief and sorrowful task. Sorrow for the year wasted composting crap that will would never serve any other purpose but to be dumped in a pile to be bulldozed into a building site. Once I got of all that crap it time to restart the bin. Only grass cuttings this year I tell myself. Better get a sign up on the bin the my subconscious screams back at me. 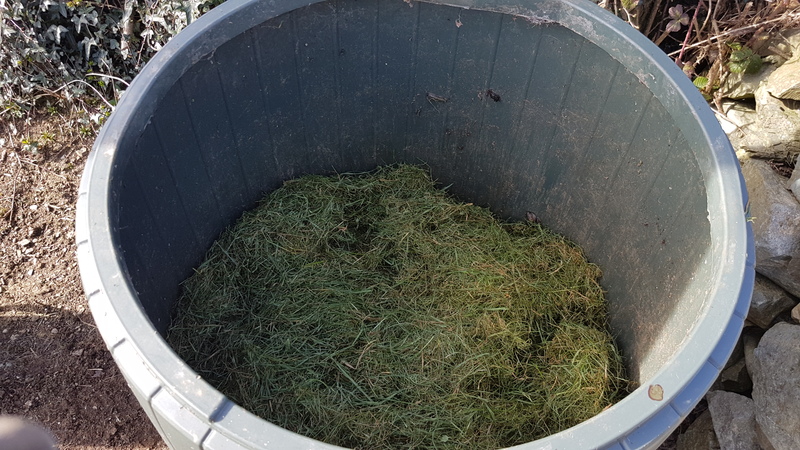 With he lawn freshly cut I rake up a token pile of grass and shovel it into the bi starting the pile on it one or two year long journey towards becoming something more useful than a simple mulch. The greenhouse beds are in bad need of refreshing. 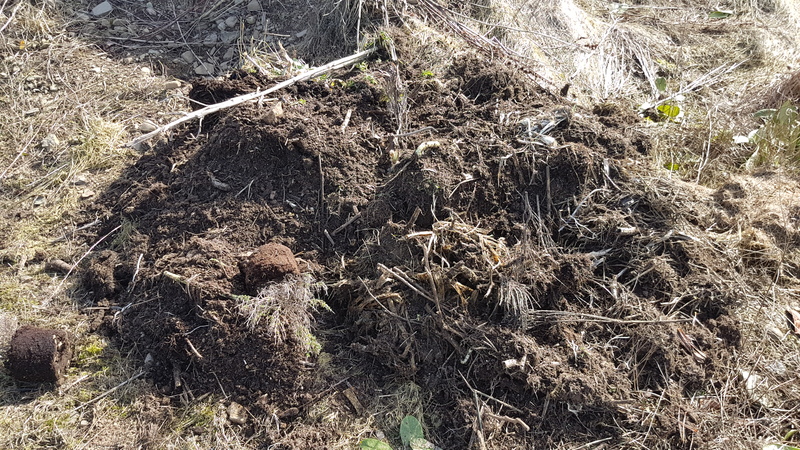 Over the winter the soil has really dried out and is lacking freshness and nutrients. Every year I dig up the beds and throw a load of fresh compost into them. This puts back in some nutrients that have been drawn out the previous season by the previously planted vegetables. Nothing to difficult here. Just grab some bags of compost from your local supplier and throw some into the beds. Give it a good turn and mix with a fork and then level it out with a rake. N my case I had to pull some of the soil out so that the beds weren’t overflowing out on to the centre path. The soil wouldn’t go to waste however. More on this in a later post.